4.5 Quart Cast Iron Dutch Oven For Only $49.00 PLUS FREE Shipping! You are here: Home / Great Deals / Amazon Deals / 4.5 Quart Cast Iron Dutch Oven For Only $49.00 PLUS FREE Shipping! If you have always wanted a dutch oven, this is the time to get one! 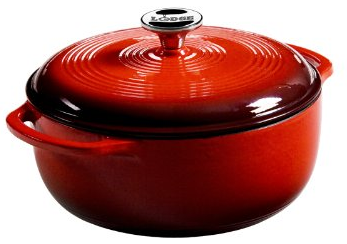 Get this 4.5 Quart Cast Iron Dutch Oven For Only $49.00 PLUS FREE Shipping! It is in “Spice Red” and enameled so this is a quality deal! It is over 50% off!